Liam Neeson is a kind of likeable “everyman.” Every year, in recent times, he makes a small, tight action movie in which he rescues himself, his wife, his daughter — or some combination — from kidnappers, usually while on vacation somewhere in Europe. The movie is usually thin on plot, heavy on Neeson’s ability to use his fists and his brains, and generally worth seeing for its entertainment value. This is not that movie. This is a vile, viscous, bloody, sadistic and cruel story that wanders around for way too long and ends in a frightening bloodbath. Sound like something worth seeing? Right. It’s not. In some ways, I should have known. I’m a big fan of reading crime thrillers; in fact, it’s my genre of choice. I like James Lee Burke for quality of writing, Henning Mankell for atmosphere, John Verdon for plot, Lee Child for style. There are very few authors I won’t read: Dean Koontz is one because he takes two chapters to describe someone opening a door – and Lawrence Block is another. Block’s characters do things that are unspeakably despicable — and they have no redeeming qualities. This movie is based on a story by him and features his main character, former New York City cop turned freelance detective, Matthew Scudder (Neeson). It has all of Block’s cruelty. Along the way, this movie keeps flashing back so we can see what torture looks like and how fear manifests itself. It’s all so overdone, so unnecessary. This is a very long movie, a very cruel movie, and not a very good movie. It should have been buried at the book stage. 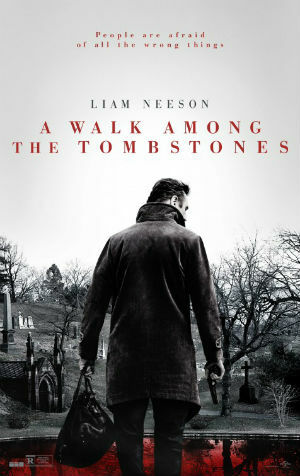 Don’t take this walk among the tombstones.